Having a stocked pantry takes the stress out of cooking and provides an inexpensive base for easy recipes to have on hand for dinners and freezer meals. 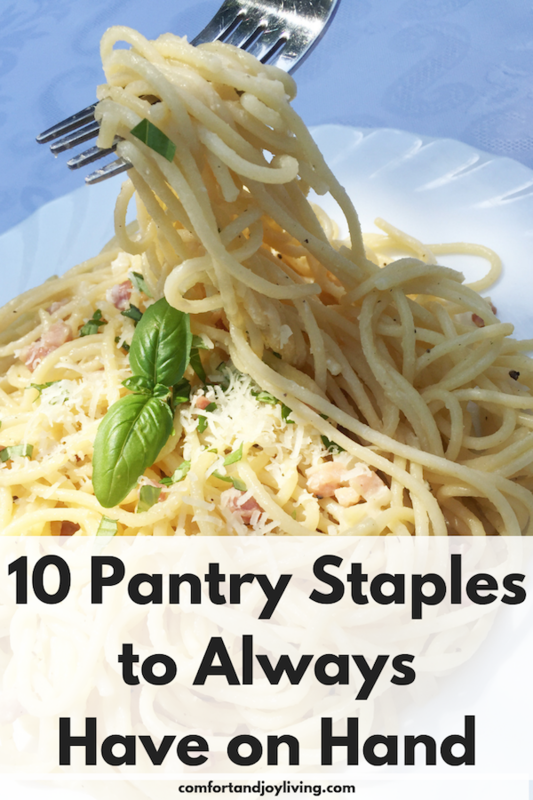 Below is a list of frugal pantry staples that will lower your grocery budget and ensure that you have a stocked pantry to help you make quick and healthy meals for your family. Rice is great as a side dish or function on its own as a main dish. You can fry it serve it with a curry, or build a burrito bowl with rice as a base. And you can choose from a wide palate of rice varieties, depending on your family’s flavor and nutritional choices. I prefer Jasmine rice because it has a sweet flavor and cooks fairly quickly. To save money, you can purchase rice in a 25 lb. bag to save per ounce and rarely run out. Of course, you can’t mention rice without following it with frugal food friend, beans. Canned or dried, beans are one of the most economical foods that can certainly fill you up and provide a whole lot of protein. I try to keep both dried and canned beans on hand. When I have the time, I soak the beans overnight in my crockpot; rinse, drain, refill with water and then cook them all day long on low. then I freeze them in individual bags. However, when I’m pressed for time, I use a can in chili or as a side dish. Whether it’s gluten-free, whole wheat or plain ’ole pasta, you can choose from a variety of shapes and even flavors. No matter what your preference is, you need to keep a box or two of pasta on hand. It’s versatile enough to use it in soups, salads, as a main dish or on the side of your main dish. Both quick to cook and quite filling, pasta allows you to satisfy your family at a low price. Soup is great to have on hand, so especially when the weather starts to get cooler, I try to stock up on it. I usually buy a whole bunch of cream soups like cream of chicken and cream of mushroom, since they seem to be the staples in most recipes. I love making meals like tuna casserole, chicken and rice, and Stroganoff with it. It’s always a good idea to have a loaf or two of bread on hand. Whether you’re making your favorite sandwich or some French toast, bread is very affordable. When you find a good deal on your favorite brand, buy a couple of extra loaves and keep them in your freezer until you’re ready to use them. Oatmeal makes for a very healthy and satisfying breakfast. You can top it with fresh fruit or honey for a sweet treat or with a fried egg, cheese and avocado for something savory. However, oats can be used for many other wonderful treats. You can bake them into cookies, quick bread or scones. You can make granola bars with it—just add your favorite dried fruit and nuts into the mix. Cheese is so versatile and makes every meal taste so much better. Serve it on a salad or melt it on fries or chips. Make homemade pizza or a casserole dish. A simple grilled cheese sandwich with a bowl of soup can be quite comforting on a cold winter day. There’s a huge variety of uses for it and almost everyone loves it. Whether making a batch of cookies or a quick omelet, eggs are a staple we always keep on hand. Fried rice, French toast or banana bread can all be made with a few other ingredients and eggs. If someone in your family has an allergy to eggs, there are egg replacers that may be able to fill the same role. Unless you’re vegan or lactose intolerant, you probably have milk in the fridge. But do you ever do more than drink it or use a little for a recipe. There is so much that you can do with milk such as make homemade yogurt, cheese, ice cream, evaporated milk and sweetened condensed milk. Often times, the homemade version is much cheaper than store-bought, and healthier too! When bags of frozen vegetables go on sale for $1 each, I make sure to stock up on them. Generally speaking, frozen vegetables are significantly cheaper than fresh, you don’t have to worry about them going bad, and since they’re flash frozen at harvest, they retain the same amount of nutrients as fresh ones.